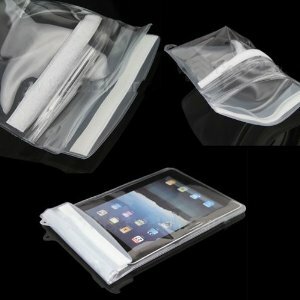 Palm employees and fanatics alike have lived through many near death experiences with their company, hardware, and software. 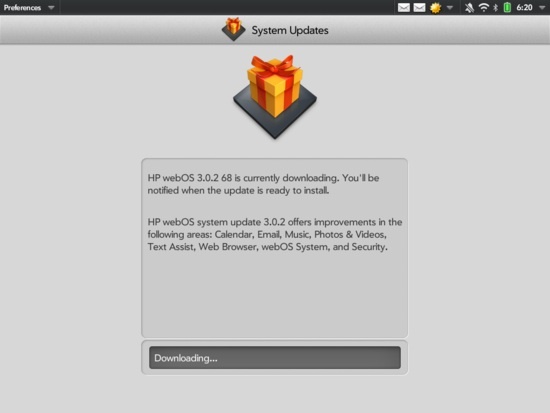 The latest rumor, if true, may give webOS a new lease on life after HP announced a drastic cut back on webOS hardware, canceling the HP TouchPad and greatly reducing the markets the HP Pre3 would be released in. 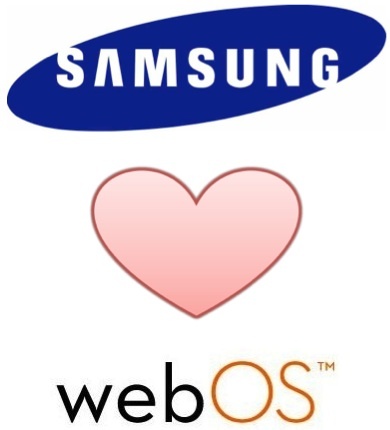 Now, according to DigiTimes, via AllThingsD's blog, Samsung may be talking to HP about acquiring webOS. "The latest: That Samsung is mulling a bid for webOS as a way of reducing its reliance on Google’s Android OS and competing more effectively with Apple. Samsung could conceivably pick up where HP left off, bringing the operating system not just to phones and tablets, but to PCs as well. Added bonus: the accompanying IP would likely prove helpful in the company’s patent battle with Apple." Publicly, at least, HP has pledged to continue to develop webOS for use on the company's PCs; which they are also looking to spin off, in a move similar to the one that IBM made a few years so. 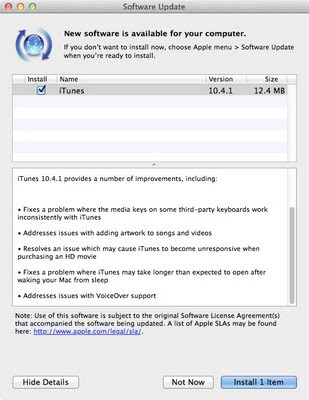 With all the fun and excitement that we've been experiencing here on the east coast (earthquakes, hurricanes, and power outages) you may not have seen that Apple has released a maintenance updates to iTunes 10. 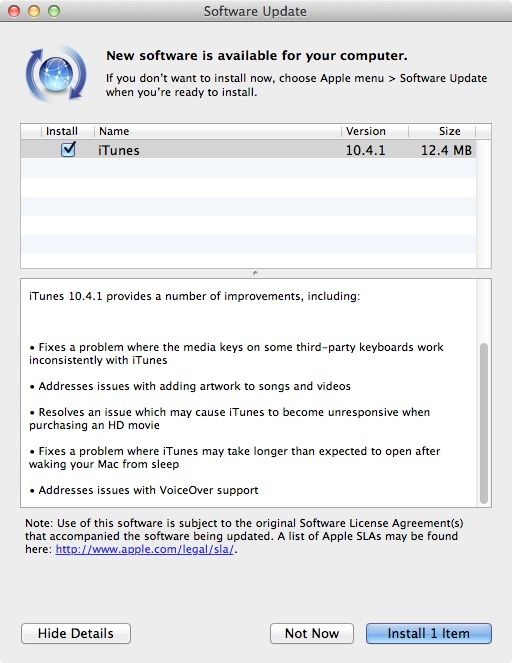 The maintenance update to iTunes 10.4.1 fixes issues with things like the addition of artwork, unresponsiveness when purchasing HD movies, issues launching iTunes after waking your Mac, VoiceOver support, and issues between iTunes and some third-party keyboards with multimedia controls. 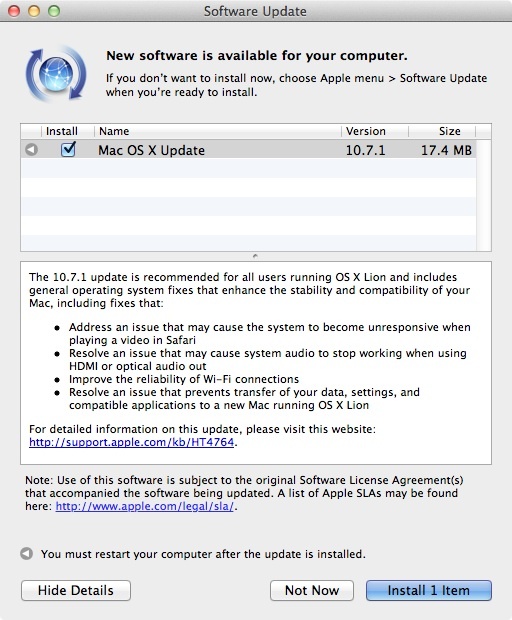 The 12MB update is available now via the Apple Software Update control panel. 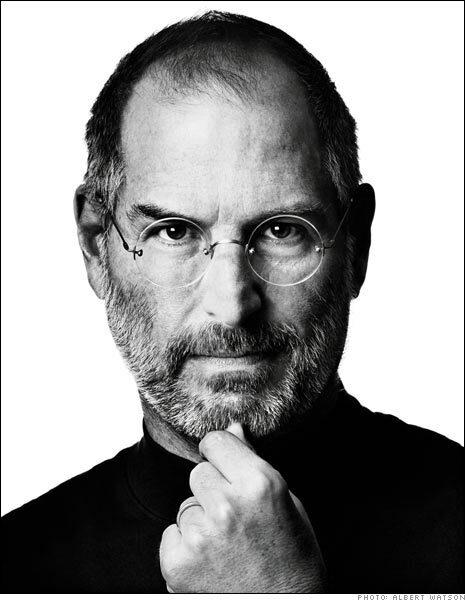 Earlier today, the leadership of Apple, Inc. passed from co-founder Stephen P. Jobs to former Chief Operating Officer, Tim Cook. "CUPERTINO, California—August 24, 2011—Apple’s Board of Directors today announced that Steve Jobs has resigned as Chief Executive Officer, and the Board has named Tim Cook, previously Apple’s Chief Operating Officer, as the company’s new CEO. Jobs has been elected Chairman of the Board and Cook will join the Board, effective immediately. Jobs submitted his resignation to the Board today and strongly recommended that the Board implement its succession plan and name Tim Cook as CEO." 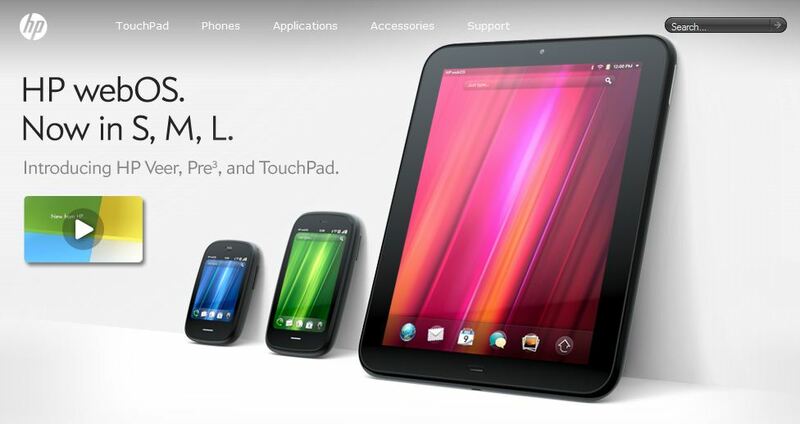 Earlier this week, HP announced during their quarterly earning call that they will halt the sale of all webOS devices, including the recently launched HP TouchPad tablet and the Pre3 smartphone. 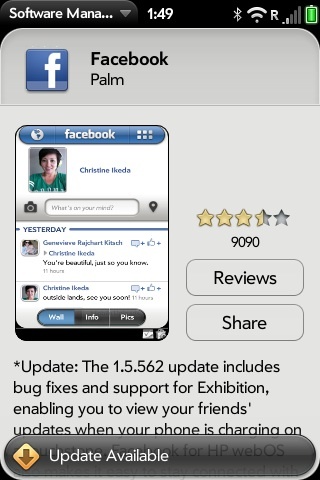 This is yet another sad day for fans of the Palm product family, but, unfortunately, not a surprising one. 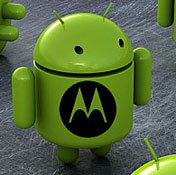 The sell through of webOS devices has not risen to the levels to allow HP and webOS to compete against the likes of Apple iOS and Google Android. HP executives where quick to point out that they had not killed the webOS operating system, but with the OS not available on any new devices and a dwindling customer install base, I don't see how HP will hope to attract third-party developers to their platform if HP themselves are not fully committed to it. 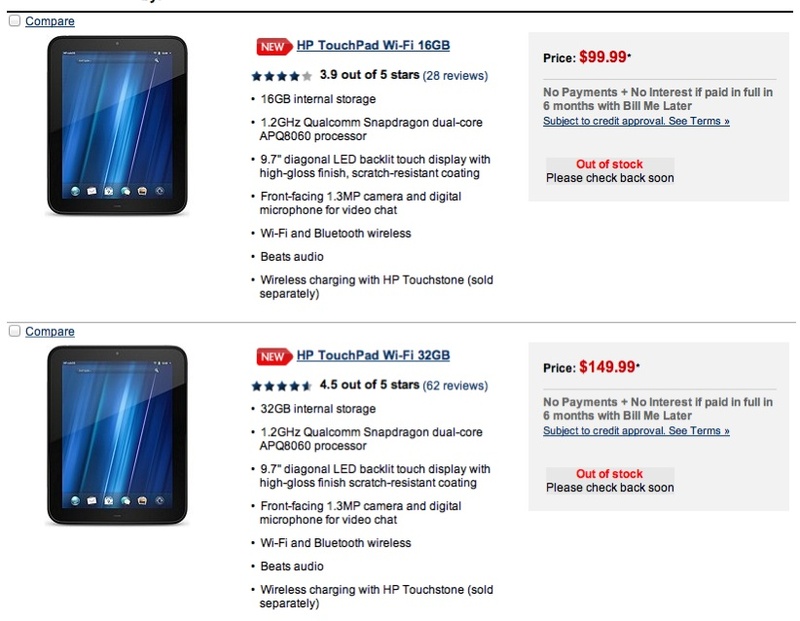 The good news, if you are a die hard fan of Palm and webOS, HP is suppose to be starting a fireside sale on their remaining inventory of HP TouchPad tablets. 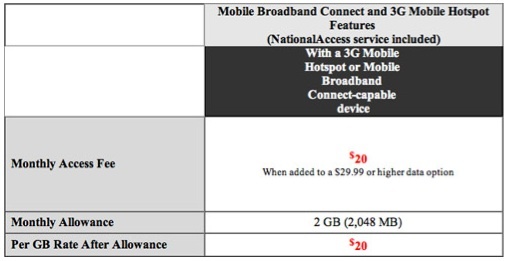 The 16GB TouchPad is suppose to go on sale for $99, while the 32GB TouchPad will sell for $149. Keep and eye on the HP online store for your last chance to pick up a TouchPad before they disappear. 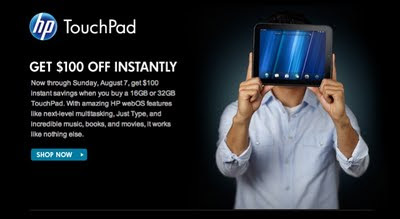 HP is running a $100 instant rebate promotion this weekend only (Friday - Sunday) on their new webOS 3.0 TouchPad when you purchase the tablet online directly from the HP.com website. I have mixed feeling about the TouchPad. 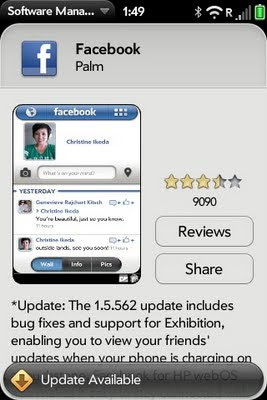 In the time since I purchased my Palm Pre, the webOS market share has failed to catch on. Then, once it became painfully clear that HP and Sprint would not bringing webOS to the Pre and Pixi smartphones, nor where they going to released updated models, HP "graciously" offered early Pre owners $50 off the TouchPad. 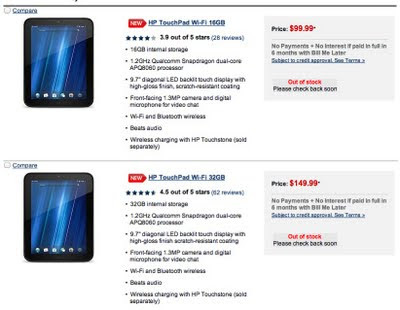 Now, less than 60 days after launch, HP is cutting the price of the TouchPads by $100. 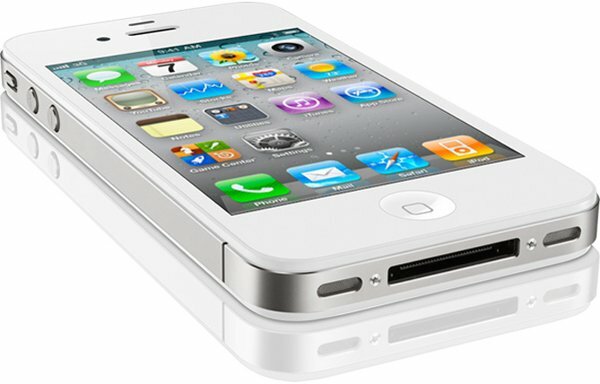 This weekend only, the 16GB TouchPad is $299 and the 32GB model is $399. 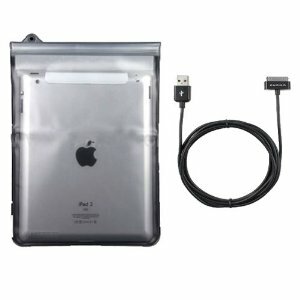 If you are inclined to get a tablet, and don't want an iPad, or confused by all the various Google Android tablets, then the HP TouchPad is probably the device for you. 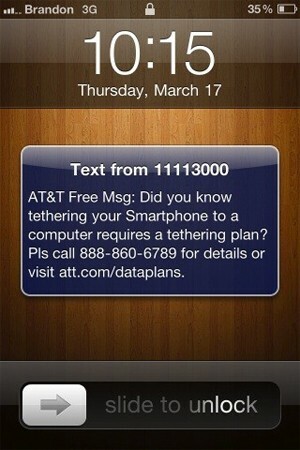 If you don't need a massive selection of apps. 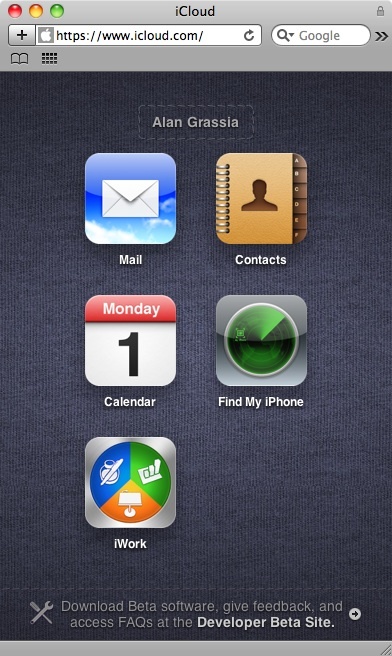 I saw that iCloud.com has gone live today and I was able to log in using my existing Apple ID. Aside from being able to look around, I'm not sure that there is much more we can do until we get iOS 5 installed on our iDevices or a update to Mac OS X that replaces the MobileMe control panel with the iCloud control panel (I'm assuming that there will be a new control panel or other software integration with the Mac OS X or Windows PC). 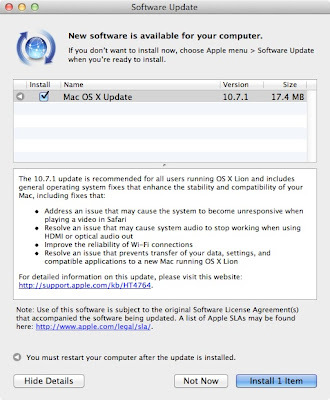 If you are registered as a paying Apple software developer, you will be able to download some additional API tools for building into your applications. 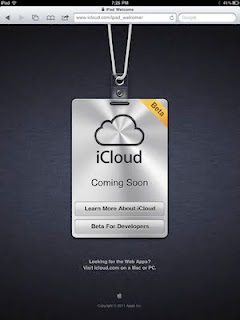 I was able to login to iCloud.com from my MacBook only. 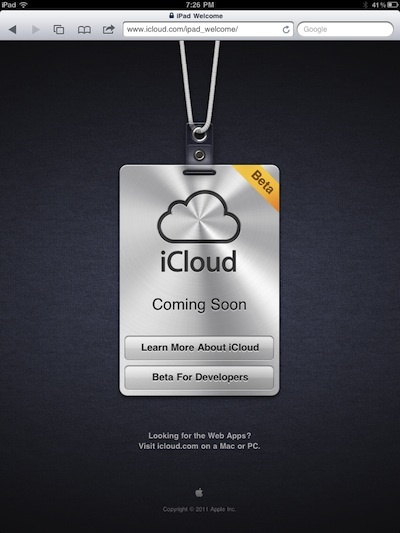 When I hit iCloud.com from my iPad, I was greeted by a beta page.